"What a strike it was from Marcus Rashford. You need some balls to take a penalty like that in that situation." What a night in Paris. Unbelievable! This is why we love football. We were all worried - 2-0 down, away from home against a top side, a whole team out with injury and suspension. But when it is Manchester United you're talking about, you always need to give them a chance. As I have said here many, many times, these big games come down to who makes the mistakes and who can capitalise on them and that's exactly what Manchester United did. PSG were controlling the game, had all the possession, but they made two mistakes - arguably three if you include the handball - and United punished them. The VAR decision has provoked a lot of controversy and you can understand why PSG were angry but, as a defender, you're asking for trouble if you jump like that with your arms up. The penalty still needed scoring, of course. And what a strike it was from Marcus Rashford. You need some balls to take a penalty like that in that situation. For a 21-year-old to control his emotions how he did was unbelievable and it's a sign of his self belief that he struck it so well. He would have been nervous - he's a human being - but it was a brilliant penalty against one of the best keepers we've seen. It was also a good night for Romelu Lukaku, who showed why he should be playing every week. Regular readers of this column will know how highly I rate him and he showed, in an important game, what he can do - he was my man of the match. 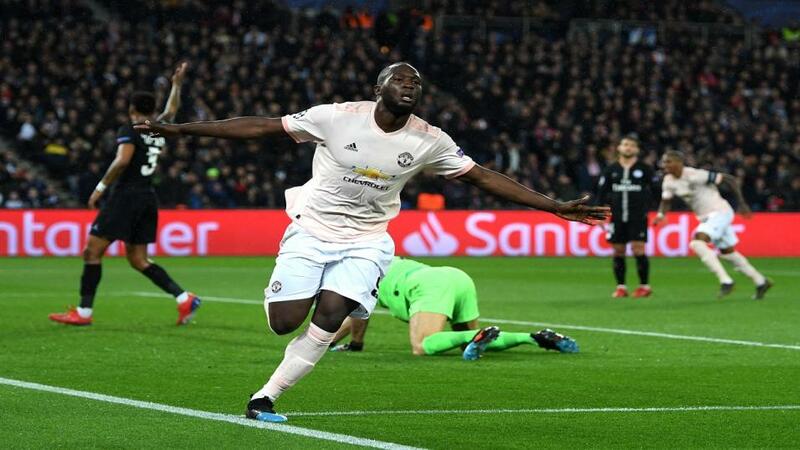 That's six goals in three games now for Lukaku and, for me, he should be in the first choice front three, alongside Rashford and Anthony Martial. That's a really flexible frontline, with all three able to play through the centre or out wide. We seem to be asking after every game whether Ole Gunnar Solskjaer has done enough to get the job full-time but we passed that point a while ago, he's been superb. It will be a crime if the Board doesn't at the very least interview Ole for the position in the summer - and he's done some audition this season! Next up for his team is a tough game away at Arsenal, as they return to the battle for top four places. The Gunners are playing well at the moment, but United have a good recent record at the Emirates, including a 3-1 win in the FA Cup this season, and with confidence sky high after PSG, I can see the visitors nicking it. Arsenal will need to play on the front foot given they are at home and that will be perfect for United with their counter attacking prowess. During my time at Old Trafford, we seemed to score so many counter attack goals against Arsenal and I can see the same on Sunday. It was a professional performance from Tottenham in Dortmund on Tuesday. They had a bit of luck early on, of course, but sometimes you need that and Hugo Lloris was on top form. I thought they were tactically good and managed the game well, and when they got the chance it fell to who you need it to - Harry Kane, with a great finish. A word as well for Moussa Sissoko, who was excellent again. He's an absolute machine - he could probably run for a week if you asked him to! The transformation in Sissoko has been unbelievable, and it's down to the belief Mauricio Pochettino had in him. This time last season, Spurs were knocked out by a more streetwise Juventus outfit but you always learn from your mistakes and they showed their extra experience in Germany. They will, however, need to cut down on the defensive mistakes in the next round - they will be facing a top team regardless of the draw, and you can't always rely on the goalkeeper or last ditch tackles to get you out of trouble. United or Spurs to win it? Why not? No-one's going to dare write United off anymore are they? As the saying goes, 'Respect the giant, otherwise you'll suffer'. Their players will have been saying 'we'll take anyone next' in the dressing room on Wednesday, and they are proving week after week that they are a match for anyone. Both they and Spurs have a chance of winning the Champions League now - they're in the last eight, so why not? As said, Spurs are gaining more experience in the competition every season and they have great attacking talent, with Dele Alli returning soon to complement Kane, Son and Eriksen. A bit of luck in the draw and you never know. After the 4-1 humbling by Ajax on Tuesday and the successive El Clasico defeats there is no way back for Santiago Solari at Real Madrid. Jose Mourinho looks like the front runner to replace him (8/11 in the Next Real Madrid manager market) and it will be good to see him back on the touchline. There is something clearly wrong at Madrid; they still have a good squad on paper but for whatever reason it's just not happening. Can a team get fed up of winning? After three Champions League successes it might be that the players have lost a bit of motivation. I know Mourinho left under a bit of a cloud, but he'll have the respect of the dressing room and will go and shake things up. He knows how to win, and that is an absolute must at Madrid. Pochettino is the second favourite for the job and if they approach him in the summer offering a big pot of money, it might be hard to turn down. It will be an interesting summer, that's for sure. You can see Real Madrid going hard in the transfer market but I can't see that including Kylian Mbappé and Neymar as has been rumoured. How much would they cost? Quarter of a billion?! It's a nerve wracking time in the title race for City and Liverpool and right now Pep's team are handling it a bit better, as you'd expect from a team who has won it before. One goal becomes so important at this time of the season - City have won their last two games 1-0, whereas Liverpool have drawn a few, and are missing chances to win. When I won the league with United, we won 10 games 1-0 - it is a real champions' scoreline. Mo Salah missed a few chances you'd expect him to score with at Everton and it looked like a sign of nerves kicking in a bit. But for all that, nothing is finished. There are still plenty of twists and turns to come and Liverpool are still well in this race.